A column of white light reaching high above the London sky has been switched on to mark 100 years since Britain entered World War One. 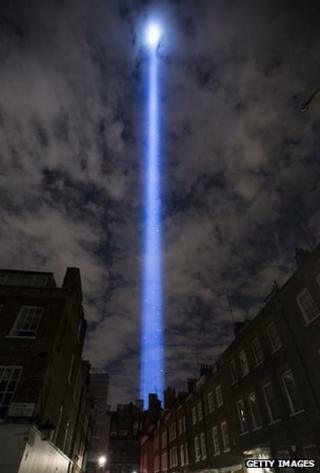 The installation, called Spectra, by Japanese artist Ryoji Ikeda, will shine from dusk to dawn for the next week. The light comes from 49 beams placed behind the House of Lords and can be seen throughout the capital after dark. Artists around the country were asked to create installations for the Lights Out event to mark the centenary. Indian artist Nalini Malani produced a large-scale video installation which was projected onto the facade of the Scottish National Gallery in Edinburgh. In Wales, artist Bedwyr Williams' light and sound artwork was presented at the site of the World War One North Wales Memorial Arch in Bangor. The artist known as Bob and Roberta Smith created a large-scale work using thousands of candles to spell out a statement to fill the lawn in the grounds of Belfast's City Hall. "What unites human beings... is huge and wonderful," it read. "What divides human beings is small and mean." Turner Prize winner Jeremy Deller came up with a digital response to the Lights Out event, creating a film which was available for only one hour during the period of darkness. Institutions and individuals were encouraged to switch off their lights for an hour starting at 2200 BST, leading up to the moment 100 years ago when Britain declared war on Germany. Numerous famous landmarks across the UK, including Tower Bridge and the Palace of Westminster, dimmed their lights on Monday night. People were also asked to light candles to mark a century since the start of war. "The lamps are going out all over Europe; we shall not see them lit again in our life-time," he said. Ikeda's work emanates from a collection of 49 spotlights placed in Victoria Park Gardens close to the north bank of the River Thames. Visitors are being encouraged to visit the gardens between the hours of dusk and dawn to see the lights at close quarters and to experience an accompanying soundscape composed by the artist. Jenny Waldman, director of 14-18 Now, the organisation bringing together culture and centenary commemorations, called Spectra "a beautiful artwork" and "a symbol of hope". "It is a testament to the endurance of the human spirit in adversity," she added.